Congratulations to Amy Hinote of VRM Intel for the first and second issue of VRM Intel Magazine. Many Vacation Rental Manager’s and Industry Suppliers follow her site religiously for industry news and information. What we did better than the rest. ICND specializes in Conversion Focused Websites. To maximize online conversions, it starts with a simple search. When you partner with ICND, we’ll make certain that your company has access to the most highly-converting quick search, advanced search, and refined search features. Additionally, our search results pages utilize some of the most advanced technology among our competitors. 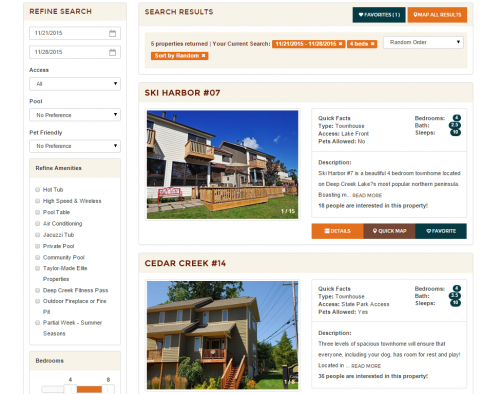 The search results pages feature an interactive and intuitive “refine search” feature, along with a clear notification of how many properties your visitor has drilled down to with their search criteria. 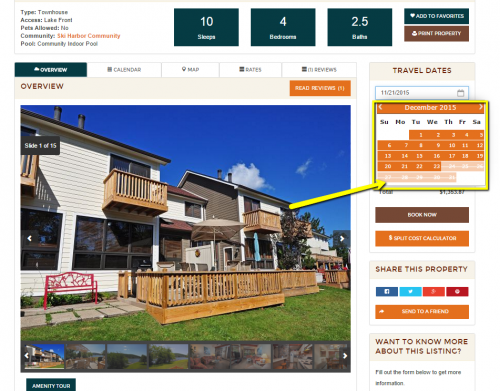 When a visitor views a property detail page and wants to enter dates to check availability, our calendars clearly block out dates that are not available. This allows for a more fluid search experience. Modern web design technology allows for a video in the header of a site, or as an accent in the footer (like we opted to do for Taylor-Made). This video section changes seasonally (a “walker in the woods” for Fall, and “a person skiing” for Winter). ICND’s streaming server allows for the best possible experience for video hosted on a site’s homepage. It’s a trend we will see more and more of in the future. Also, video home tours may become the feature on the property detail page – and we’re already well prepared for that. We take conversions seriously at ICND. Through research, testing, and expert analysis we incorporate the tools into your website to funnel traffic and convert more lookers into bookers. Our websites are more than a pretty face to your company. They’re also a well-oiled machine that will perform for you. But that’s not where we stop. Instead, we continue to analyze your traffic funnels and exit points to ensure that you’re putting more “heads in beds” with the visits that come to your website. We take this same approach with our Digital Marketing. Every dollar spent is analyzed for conversions. ICND makes sure that we aren’t focusing on driving traffic alone, but instead driving traffic that will book or make contact with you. From dialing in SEO and PPC keyword phrases to stepping up email marketing campaigns, to strategic branding and retargeting campaigns through Social Media – ICND is here to lend you a strong marketing hand dedicated to helping you get more out of your efforts.